A complete portfolio of accessories including coaxial, triaxial, RF probe arms, high-temperature Kelvin and high-current probes up to 400 A are available to complete the prober system. 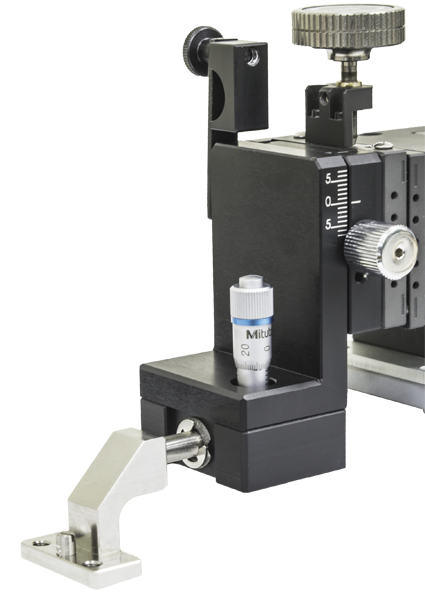 The MPI Kelvin probe holder has a unique vertical self-leveling probe tip which is isolated as close as possible to the DUT up to 300 °C. They are the new benchmark for accurate ultra-low noise, impedance or pulsed-IV measurements. Making a novice user able to perform fast and accurate measurements, the Kelvin probes provides easy reconfiguration for 4TP-connecttion or/and splitting the ground for pulsed-IV tests. The RF probe arms are enabling easy and very convenient probe leveling. The fast and tool-less vertical height adjustments with build-in mm-scale is a small example of great usability by working with different RF Probe technologies. Extensive selection and dedicated design of vibration isolation platforms, tables with integrated racks for computer, key-board tray, dual-monitor stands, EMI-shielded DarkBoxes, probe card and PCB test holders, vacuum pumps and air-compressors are an example of the variety of accessories completing the common MPI Test Solutions.